This section contains information related to FlyNordic, flight code LF, a low-cost carrier regional type. "FlyNordic originates from a privately-owned airline that as of 2001 was operating between Luleå and Stockholm. Finnair purchased the majority of the company in the autumn of 2003 and with the new management a new business concept was introduced and a lowcost airline was born. At the same time the traffic program expanded dramatically with new routes to Oslo, Copenhagen, Gothenburg and Umeå. 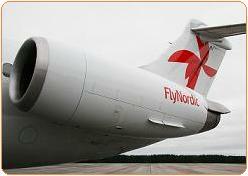 The objective for FlyNordic is to become the leading low-cost and low-fare airline in Northern Europe. FlyNordic operates mornings and evenings to destinations that business travelers demands and during the day to destinations which leisure travelers request. FlyNordic aims to create additional value to both business and leisure travelers through offering a high degree of service at a low fare. With that more travel by more travelers can be achieved. The FlyNordic service concept includes among other things booking online or by telephone, only operating at major airports, attractive departure times, ticket less travel, changeable tickets (both dates and names) and fixed student prices." Click to browse to the network development section of this site, featuring more more information on the network development of FlyNordic.